Most plastic materials contain impurities that can easily be removed by a screen changer installed in the polymer melt flow path of the extruder. Mesh is the same fabric web as the extruder barrel. Usually, the same group of several different layers constitute a package. The thinnest mesh filters the smallest solid particles in the melt stream and the outer coarse layer is stronger, preventing larger particles from entering the inner fine mesh prematurely. To resist the forces generated by the melt flow, the screen pack is lined with a dense, circular steel disk, called a shield, which fits into the groove at the end of the extruder barrel. In order to change the blocking net lining, remove the downstream equipment, replace the old net with a clean net lining and re-install it on the production line. Screen changers do not require downtime and labor to change networks. According to its design is divided into two main types: interchangeable and continuous. Interchange screen changers have two identical groups. One is mounted on the melt flow path. When the mesh group gets dirty, replace it with another set of clean same groups. At the same time, the old same group got outside replaced. Two sets of mesh units are mounted on the same steel plate, rotated about a shaft, or slid along a straight line of the guide. The former is manually operated by a lever which slides the screen back and forth by hydraulic pressure from one side to the other. Another type of screen changer operation uses a valve to reverse the flow of the solution from the blocked group to the new group. Continuous Screen Changer: A continuous screen changer moves the new web gradually into the melt stream while removing the old web. Screen speed can be adjusted automatically according to the amount of impurities, with a continuous screen changer to eliminate intermittent operation of the network pressure and melt temperature changes. A extrusion screen changer is based on a rotating skateboard. Several mesh groups are arranged on the periphery of the ratchet-driven turntable. Turn the turntable, used the same old group from the melt flow out, in contact with the melt flow, with the hands of a new group. Some machines also use a strip of wire (usually 120 feet long). In the strip network into or out of the machine parts, a small amount of plastic cooling, harden the polymer can prevent leakage. 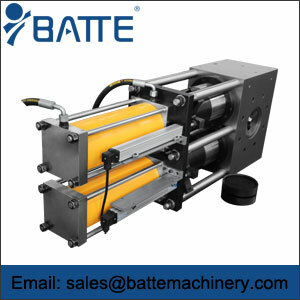 These machines pull the filter out with external hydraulic pressure. Another design is to use the pressure in the hand without pulling the filter out. Zhengzhou Butter Melt Pump Co., Ltd. can be based on the production of materials, for its allocation of special screen changer, including XPS Extrusion plate dedicated screen changer, blown film dedicated non-stop screen changers, pipe and special pipe special screen changer . Zhengzhou Delo Technology to provide screen changers can be widely used in chemical fiber, blown film, flat film, cast film production, pipe, sheet, wire, fiber manufacturing, cutting lines, recycling and so on.